^ Records of the Past, [Archibald Sayce], 2nd series, Vol. 1, 1888, p. 11. ^ The Seven Great Monarchies of the Ancient Eastern World, George Rawlinson, Vol. 4, p. 526-527. ^ 德尼·克伊朗. 羅浮宮參觀指南. 黎絲藝術出版社. 1997. ISBN 2854950992. ^ Tertius Chandler. Four Thousand Years of Urban Growth: An Historical Census (1987), St. David's University Press. ISBN 978-0-88946-207-6. See Historical urban community sizes. ^ Mieroop, Marc van de (1997). The Ancient Mesopotamian City. Oxford: Oxford University Press. p. 95. ISBN 978-0-19-158845-7. ^ Boiy, T. (2004). Late Achaemenid and Hellenistic Babylon. Orientalia Lovaniensia Analecta 136. Leuven: Peeters Publishers. p. 233. ISBN 978-90-429-1449-0. ^ Albert Houtum-Schindler, "Babylon," Encyclopædia Britannica, 11th ed. ^ Bradford, Alfred S. (2001). With Arrow, Sword, and Spear: A History of Warfare in the Ancient World, pp. 47–48. Greenwood Publishing Group. ISBN 978-0-275-95259-4. ^ Saggs, H.W.F. (2000). Babylonians, p. 165. University of California Press. ISBN 978-0-520-20222-1. ^ Cyrus Cylinder The British Museum. Retrieved July 23, 2011. 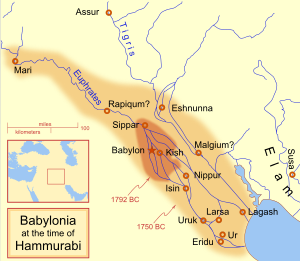 ^ "Mesopotamia: The Persians". Wsu.edu:8080. 1999-06-06. Archived from the original on 6 December 2010. Retrieved 2010-11-09. ^ Beck, Roger B.; Linda Black, Larry S. Krieger, Phillip C. Naylor, Dahia Ibo Shabaka, (1999). World History: Patterns of Interaction. Evanston, IL: McDougal Littell. ISBN 978-0-395-87274-1. ^ "Genesis 10:10 NIV - The first centers of his kingdom were". Bible Gateway. Retrieved 2013-03-25. ^ Gettleman, Jeffrey. Unesco intends to put the magic back in Babylon, International Herald Tribune, April 21, 2006. Retrieved April 19, 2008. ^ Bajjaly, Joanne Farchakh (2005-04-25). "History lost in dust of war-torn Iraq". BBC News. Retrieved 2013-06-07. ^ Leeman, Sue (January 16, 2005). "Damage seen to ancient Babylon". The Boston Globe. ^ Heritage News from around the world 互联网档案馆的存檔，存档日期2016-02-02., World Heritage Alert!. Retrieved April 19, 2008. ^ Cornwell, Rupert. US colonel offers Iraq an apology of sorts for devastation of Babylon, The Independent, April 15, 2006. Retrieved April 19, 2008.